Umbra Standard also now available in improved modern materials with a discrete black finish, at a substantial savings. 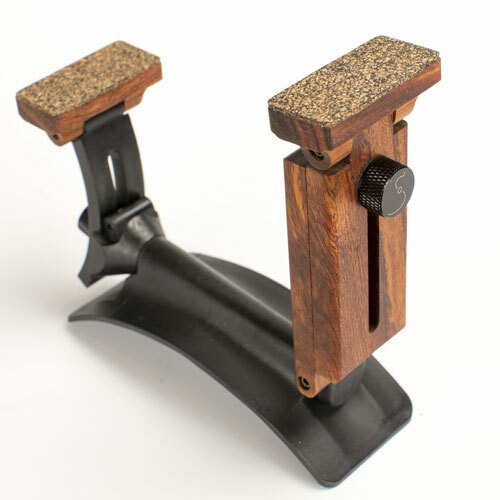 The handmade Atlas, and the less expensive and modernized Umbra Standard are the only supports that attaches to your guitar with magnets. Once you find the perfect position for the support, you simply attach two high strength magnets inside your guitar along the lower bout with removable 3M Command Strips. With the magnets in place, the support attaches to the exact same spot on your guitar every time. It attaches and detaches very easily. Four separate mechanisms allow you to adjust your guitar's angle, height, horizontal position, and tilt toward/away from your body. You can adjust the support for left or right leg playing styles. With so many adjustments possible, this support accommodates a wide variety of positions - even the cello-style position of Paul Galbraith. 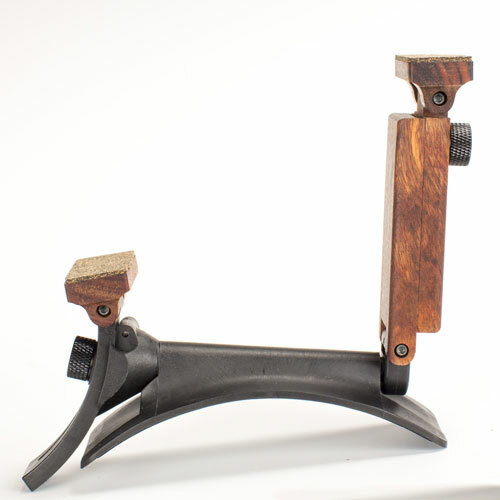 And unlike some guitar supports, this product works for left-handed guitarists without any modifications. At the lowest setting, the support lifts the guitar off your leg between 3 inches (steep angle) and 5 inches (minimum angle). At the highest setting, it lifts the guitar between 6 inches (steep angle) and 7 inches (minimum angle). 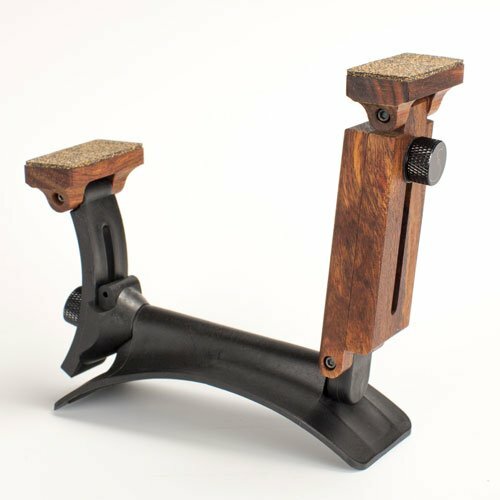 I’ve always had complaints about my guitar supports, but no more! When my Sageworks support arrive I places my guitar on it without even using the magnets, and it was the most stable support I’ve tried. Suction cups, cushions, footstools can’t compare. I installed the magnets shortly later and I couldn’t be happier. My only advice is to really pay attention to the angle the guitar will sit on the magnets. If it’s too severe they will move. You the want the guitar to sit right on top of the lower magnet, not slanted at all. I watch a pro fight with his support recently because he set to great a angle and it collapse mid performance. Follow the instructions and you’ll be fine! 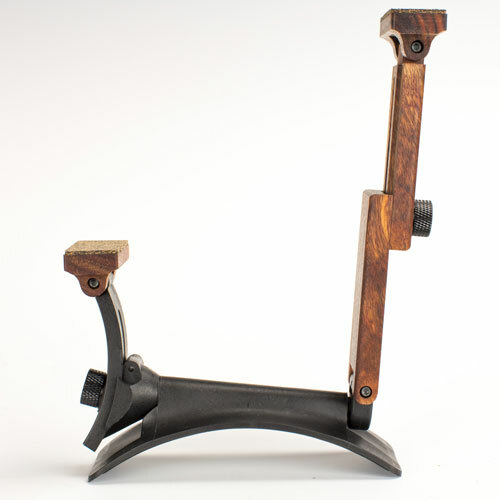 The support is sturdy and adjustable as far as angle is concerned. I have a French finish and the Sageworks won’t damage it. I am very pleased with the product and have no complaints. It’s simple and does what it should do, what more can you ask for? I was very impressed with the level of personalized service. On both occasions my issues were promptly taken care of by a real human. No wait time with phone menus! The guitar support feels very anti and has relieved neck tension. I will do business with string by mail I’m the future. Got it here a day earlier that I expected. Thanks for the continued great service! Q: Hoy can i know if my guitar is enoughly deep for put the magnets in the correct position? The magnets are about 1 7/8 of an inch long. If your guitar's body is 2 inches or more deep there should be sufficient clearance. Q: Do the "inserts" that fit inside the guitar body alter the sound in any way? Do those magnets make your guitar heavier? A: No it does not alter the sound of the guitar. Yes it does add a little bit of weight. Q: Hi, how do I decide if the short or standard model version is the right one for me? Minimum height - 1 1/2" and 4 3/4"
Maximum height - 2 3/4" and 7"
Minimum height - 1 1/4" and 3 3/4"
Maximum height - 2 3/4" and 4 3/4"
Please let me know if there i anything else I can help with.